Villa Suite Acajous is a great choice for you and your significant other’s next getaway. There’s a private pool, wooden deck, and al fresco dining if you want to hang out at the villa all day, but St. Jean Beach is also just a short drive away. Inside, you can watch your favorite movie on the flat screen Apple TV or cook a meal together in the industrial-chic kitchen. At the end of the day, let the master bathroom’s Italian shower massage jets wash away every drop of stress and weariness you’ve collected since your last vacation. 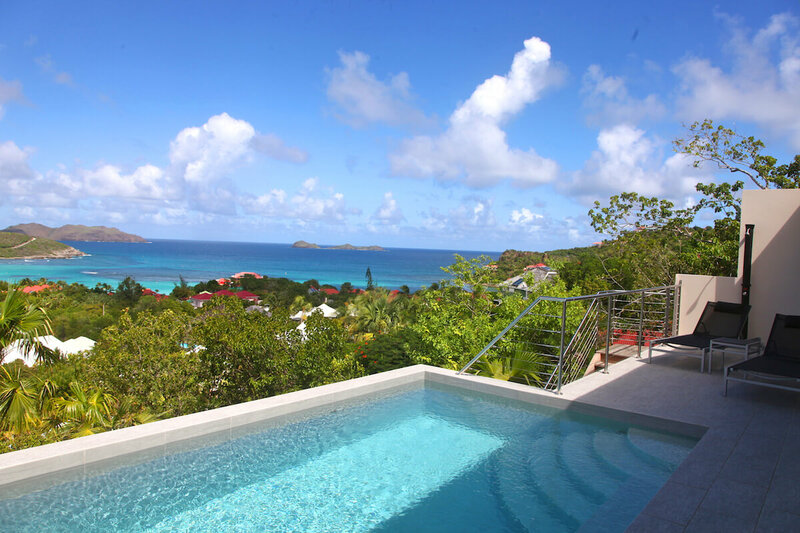 Villa Suite Acajous is a contemporary, romantic gateway with a breathtaking view over St. Jean’s bay and Eden Rock. With daily housekeeping, full air-conditioning, and ocean views, this vacation home is perfect for a couple who wants to sit back and relax in paradise. Spend the afternoon floating around the pool, gazing at the sea, and sunbathing. For a day by the sea, pile the villa’s beach accessories into the car and take a short drive to St. Jean Bay. There’s ample entertainment at the villa, between the living room’s large plasma HDTV, DVD player, and Bose sound system. The vibrant, modern kitchen is decked out with a wine cooler, espresso machine, ice machine, and gas grill. Dine al fresco on the terrace after cooking a feast on the grill or on the kitchen’s stainless steel appliances. The master bedroom has a large king-sized bed with walk-in closets and an office area with a DVD player, phone, and a flat screen TV. The ensuite bathroom has a double vanity and an Italian shower with massage jets that creates a private spa experience. Villa Suite Acajous is ideal for a honeymoon or anniversary celebration. Take a short drive to party at Nikki Beach or dine at one of the several restaurants around the villa. Upon arrival guests will be met at the airport/car rental area by a member of the villa management team. After securing their rental vehicle the guests will be led to the villa.